So you’re interested in finding out how to start your own cleaning company? That’s great! It’s a wonderful way to contribute something positive to your town or city, and cleaning is a service for which people will pay generously. Here’s what my mom said years ago when I told her I was looking for work. At the moment I was folding laundry, and as I smoothed the wrinkles out of my freshly washed pants, a small, brilliant lightning flash went ‘kapowie’ in my mind. A few years later I met Ev and we figured out how to start our cleaning company together. Of course there were a few steps in between, but it did begin with that lightning flash of inspiration. Who needs what in your community? Open your eyes and look around, and you will find out which neighborhoods or local companies regularly hire a cleaning service. 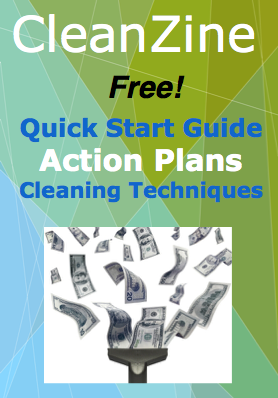 Then you can take the next steps to find out how to start your own cleaning company and respond to that need. Find your target neighborhoods or districts. Try this: Look at your town through the lens of your smartphone. Pictures give us new perspectives, so walk around your city and take a few snapshots—not of people—of streets and neighborhoods. I guarantee you will see things you would otherwise miss. Really see what you’re looking at. Being an investigator means noticing where something looks different than the rest. So notice where the residential streets look cared for. Where are the neighborhoods that look like somebody makes an effort to maintain them? They want it to look good, and it’s a strong bet these residents hire cleaning service companies, just as they hire gardeners to maintain their landscapes. Go and check out the light industrial or commercial office sections of town. The law offices and insurance companies. Consider the restaurants and county buildings, or the theater district. You might want to find out how to start your own commercial cleaning service company. Connect. Pitch your cleaning service in 30 seconds or less. Networking is a buzzword for a very natural human thing. Make friends out of strangers. All you need to do, really, is smile and introduce yourself. Let people in your target neighborhoods know who you are and what you do. Tell them about your business in succinct language. Honestly, 30 seconds or less. Give them something positive to associate with you—a genuine interest in them and a smile is perfectly adequate. The point is to make a connection. Most people will not need to hire a cleaning service right off the bat. What’s important is, you’ve made a connection. Next time they think of hiring a cleaning service they will think of you. Your image will pop into their mind. If you left a positive impression, that’s super. Bingo. Who’re they going to call? Deliver. Follow through with outstanding service. Everyone can make promises. It’s the people who actually follow through on their word who leave a lasting impression on us, who really brighten our day. The friend who never lets you down, who picks you up from the car place when you unexpectedly need a ride. The brother or sister you know will answer the phone and make your heavy load feel instantly lighter. What sort of business do you want to run? The service that nobody hires back because it let you down? No way! But you know what I’m talking about. A service person who enters the house and makes you feel uneasy from the start—that’s not a service that will get a return call—ever. The cleaning business you want to start is the one that lifts people up, not lets them down. Following through with excellent service is not that hard to do. That’s why it never ceases to amaze me how sloppy and awful some service companies can be. As you investigate how to start your own cleaning service company, keep in mind that people are basically the same, no matter what surface differences may make it look like. We want to avoid difficulties. And we want to feel good. That’s what is so wonderful about the cleaning business. Having a fresh clean environment makes us feel good. That’s all. And that’s enough. People want to have it all the time because it’s like a healthy addiction. And yet soon after every cleaning, new dust bunnies appear beneath tables and sofas. Mirrors, basins, and surfaces magnetize grime and gunk out of nowhere. Your customers pay for your service because they crave how good they’ll feel when they walk in the door and see everything clean and tidy. That’s finding a need and filling it!